Now electronic flight bags are not something new, but those of you who are not authorized to fly a plane (in other words, 99% of our readers) may not have really heard of them. You see, an EFB can be viewed as a pilot's best friend providing him with vital information such as the aircraft's operating manual, global navigational charts, and a moving map for air and ground flight maneuvers. All of this might be possible with an iPad very soon. Suitably named Electronic Flight Bag, the aircraft-oriented app supports paperless flight management operations and provides the pilot with flight charts, weather data, and a whole bunch of other aviation-specific tools. The application is still undergoing vigorous testing, but it should be commercially available in June of this year. Until then, a preliminary version will be available on iTunes at no charge. After its launch, Electronic Flight Bag will probably not make it straight to commercial jet aircraft, but it may become common for smaller planes to start taking advantage of it. However, the big question is whether passengers would really feel comfortable being partially dependent on the reliability of an ordinary tablet computer. 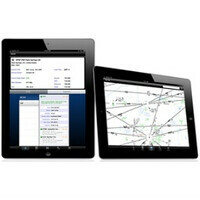 If having an iPad running inside of an airplane's cockpit sounds a bit disturbing to you, feel free to share your thoughts with us by dropping a comment below. as far as i know pilots on larger jets sometimes use laptops at the moment - which would you prefer - a pilot who relies on a laptop running windows or a pilot relying on a tablet running mac ios?